CHECK IT OUT, YOU MIGHT LIKE IT? Dean is coming on Friday already, but we have no extra training planned. Dean is also bringing some of his top students with him this time, so I’m sure they will also help him with the teaching. This will be an exciting seminar, he will teach lot’s of stuff we usually don’t see in the trainings in a regular Bujinkan Dojo. Place: We booked the dojo. We will be in Kaigozan Dojo on Sveavägen 130 in Stockholm city (here is the map). 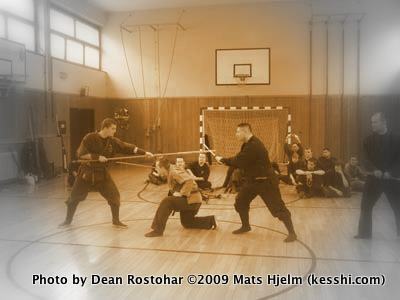 Saturday training: We open the dojo after 10:00, the training start at 11:00 and finish at 18:00 with a longer lunch break. Saturday evening: As usual we want everyone to join us for dinner at a local restaurant, if you don’t hear about this by e-mail we will inform you about it Saturday morning. Sunday training: we start at 11:00 and finish around 15:00. We do not have a longer lunchbreak, so prepare yourself with something to eat during the short breaks. Late people: if you haven’t signed up for the seminar do so immediately, or look at the web site first to see if there is places left before you come. Seminar fee: One day training is 500 SEK, for both days 850 SEK. We suggest that you sign up and pay early next time to get the discount! As you know this years theme is the Togakure school. And what we is studying is the 面 OMOTE, outside or the visible and the 空間 KUUKAN. Next year we will be studying the 裏 URA, the inside, what is not visible or the secret. Soke said that next year we will go beyond kuukan. First I’d like to remind you of my previous posts about not going ahead too soon, and instead follow the natural way and do things with good timing. So what he meant by going beyond kuukan we can leave for next year… no need to worry about that now. 空間 KUUKAN means space, room or air space. The first kanji KARA means emptyness, vacuum or blank, also SORA means sky or the heavens. The second kanji MA means space, room, time or pause. It can also mean many other things, for example KEN which is a measurement used between pillars, the same length as a tatami mat, 1,818 meters. In Koto-ryu for example you should be able to jump 2 ken sideways. Other Japanese budo arts use and emphasize the same kanji for 間合い MAAI (interval), but in Bujinkan we instead speak of kuukan which has a deeper meaning. It is not just the distance, it is more how you use the distance that is important. For example if you have a pistol on your right side of the hip, you should keep this side away from the opponent so that he cannot take your weapon, and also so that you have room to draw your weapon off need be. So this year we are developing our 空間感覚 Kuukankankaku, our sense of using the space between ourselves and the opponent as well as everything else around us, including possible weapons, doors, trees, stones, cars, other people etc. In art they also speak of kuukan. For example using a big white paper and not too much black ink. Instead of looking at the black ink you look at the big white spaces. Or a zen garden one stone in the middle of a big field, it is the same thing, kept very simple. Maybe the same thing can be said about budo, keeping the techniques simple and leave plenty of room that can be used if needed, instead of complicated techniques that leaves out the freedom to henka, change. The key is to keep it simple, I think. We have trained mostly on the first six techniques from Santo Tonko no Kata, the 7th technique is two opponents and you throw metsubushi, strike and disappear, the 8th technique is two in front and two behind, and the 9th is three in front and two behind, you throw teppan and metsubushi, and then disappear. Training on these three techniques seems somewhat pointless, more important is that any technique you train on with your partner you should also try to see everyone else in the dojo as a potential opponent. But there is also many other techniques in Togakure-ryu I hope I will get a chance to study this trip. This year is even more formless than before, the idea is that a really skilled fighter will pick up what technique you is about to do the same instant you think of it. Almost like the sakki test, but more advanced, it is like the really skilled person can read your mind. So how can we defeat someone that knows what you will do the second you think of the technique? Well, this is not easy, but this is the level Hatsumi Soke is teaching now. 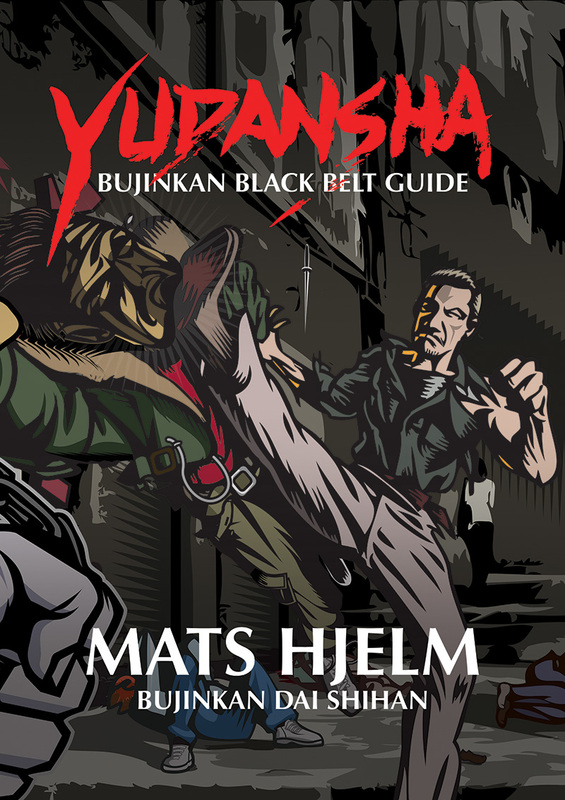 If you don’t understand, don’t worry he is teaching to those with 15th Dan, the so called true Shihan of Bujinkan. 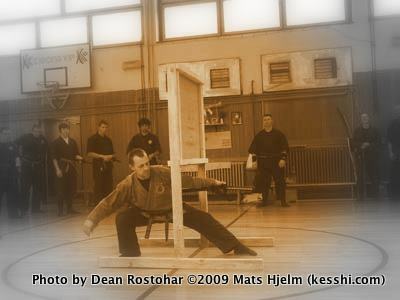 In other words those who have reached the highest rank in the Bujinkan system. Traditionally the highest rank in a ryûha is called 免許皆伝 (men-kyo-kai-den、initiation into the secrets of the art), on the new scroll in the honbu Sôke has written Menkyo kaiden with alternative kanji ( 免虚怪伝 ), where the second character means void, emptiness or untrue, the third character means suspicious or mysterious. So maybe becoming a menkyô kaiden in Bujinkan means that you are walking along the mysterious tradition where nothing is as it seems.